The high demand for coltan is helping fuel the bloody civil war in the Democratic Republic of Congo as rival armies fight over reserves. In the interests of full disclosure, I’ll admit I have no idea what “iOS4” means. But my eye was caught by the admission that the iPhone 4, launched in Australia on July 29, was almost the same as the iPhone 3. Corporations use “inbuilt obsolescence” as part of artificially creating markets. This means the products they sell are deliberately made to break down — so we have to keep buying more. In the case of products tied to ongoing innovations, the trick has a variation. Makers will hold back innovations in order to release, a short while later, a new version of the same product with a few extra features. The trick is to convince us the old version is now worthless because the new one has a couple more bells and, sometimes, a new whistle. What are the tweaks that make this iPhone 4, which sells for up to $1000, such a great investment just one year after the release of version number three? Before I looked it up, I wasn’t even sure what a bevel was. I am still unsure what it has to do with a phone call. Now even I know what a hue is, I am not that thick. But I can’t be that smart either, because I never even realised the tricky devils were being untrue. All this time, hues have been cheating me and I was too stupid to notice. That must be a bad thing because the reviewer went on: “The iPhone 4 seems more true to life.” I reread that sentence many times and finally concluded it made some existential argument about the meaning of life, as it relates to “smart phones”, that went over my head. Maybe it’s just me, but I can’t recall the last time I looked at a font and thought “if only it popped more”. And the great irony is, as a phone, it doesn’t even work very well. Apple has been forced to concede the iPhone 4 has serious reception problems. The June 25 Sydney Morning Herald said if you hold the phone in your left hand, the reception cuts out. I don’t what the technical term for the problem is, but it seems the antenna’s fucked. That, at least, is a problem I can relate to. Apple has been forced to offer a free “bumper” case that helps fix the problem to all Australian consumers who buy the product before September 30. After that, you’ll have to fork out for your own. Truer hues or not, if you hold an iPhone 4 in the wrong hand, you’re screwed. I may be biased as the whole concept of “smart phones” is foreign to me. My attitude to mobiles is they need to do three things: Make phone calls, take phone calls and let you play Snake. But I can see why people get excited by phones that take photos, search the web, access hundreds of strange things called “apps”, let you read books that might be out on loan at the library, and give you the ability to shoot and edit films of high-enough quality to win an award at Cannes. But, as cool as that sounds, it doesn’t explain what is driving the ceaseless array of new products pumped out by Apple and its competitors. This has to do with capitalism’s endless drive to expand. The creation of more and more slightly different pieces of technology that will be redundant next year is part of the same underlying crisis of capitalism that led to the 2008 financial meltdown. Each sector of capital needs to constantly grow — or fall victim to competitors. The problem is there is a limit to how much markets can expand. There are only so many people in the world with only so much cash. One solution since the 1970s has been for capital to increasingly shift investment from the “real economy” (in which actual products are made) into financial speculation. Divorced from the real economy, this created a bubble whose bursting was as inevitable as next year’s release of an iPhone 5 featuring even truer hues and better bevels. The race to sell us ever more gadgets offering things we previously had no idea we wanted is another part of the same problem: how to generate more profits when there is a finite amount of things people can afford to buy. This is where capitalism comes up against its own contradictions. To compete, each capitalist needs to minimise costs and maximise profits. This means each capitalist has an interest in trying to drive down the wages of their workforce. Of course, the modern, enlightened, employer does not, as a general rule, seek anything so draconian as an outright wage cut. The trick is to ensure wage rises fall short of price rises. By failing to keep up with inflation, workers’ wages fall in real terms — even if incomes rise on paper. In the United States, the world’s richest nation, real wages have not risen since the early 1970s. This may be good for capitalists on an individual level, but it threatens profits overall. Most consumers are also workers. Keeping wages downs means they can afford to buy less. One way around that is to ensure access to cheap credit — allowing ordinary people to spend beyond their means. As the ’08 financial crash showed, this can only work for so long. Yet capitalists have no choice but to keep trying to expand. With competition for consumers’ finite spending cash increasing, ever-new gadgets are thrown at us that make our old gadgets outdated. Such gadgets are assembled in factories in China and other “developing” countries under conditions of super-exploitation that would make the owner of an Industrial Revolution-era workhouse blush. Foxconn has installed nets to prevent workers from jumping to their deaths at its factory buildings. The May 27 Telegraph.co.uk reported on a factory in Longhua, China that makes products for Apple. Conditions were so horrific, 16 workers had killed themselves since the start of the year. Nets have been erected around the Longhua factory buildings to stop workers jumping to their deaths. Worse, a key mineral used to produce many consumer goods, including mobile phones, is the highly valuable coltan. The high demand for coltan is helping fuel the bloody civil war in the Democratic Republic of Congo as rival armies fight over reserves. A 2008 International Rescue Committee report estimated more than 45,000 people were killed every month in the ongoing conflict, the January 23, 2008 British Guardian said. Half of the those killed were children. The death toll was put at 5.4 million people since 1998. 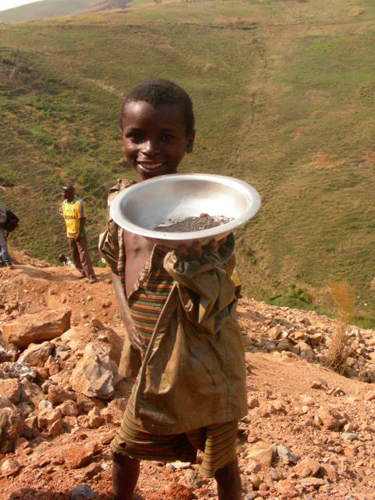 The concept of blood diamonds, whereby the sale of the gem helps fund ongoing slaughter, is well known. By the same logic, our mobiles are blood phones. None of the breathless reviews of Apple gadgets make any mention of this ugly reality — that would be too true to life. Worse still is that such ridiculous over-consumption, with the ceaseless production of ever more gadgets to be replaced as soon as possible, is threatening to kill the planet. That’s as true as any hue — even if it comes with a free bumper case.